The NSP-4605B Multi-Function Headlamp features a multi-position tilt head design and has a tight-beam long-throw spotlight designed for distance illumination. 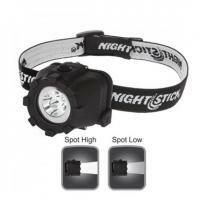 This product features a single top mounted switch that activates both the 150 lumens high-brightness spotlight and the 80 lumens low-brightness spotlight. Power comes from 3 AAA batteries (included).